If you are an employer, then the chances are workplace pensions (also known as Auto Enrolment) will affect you. Subject to your staging date, all UK employers are now legally bound to have offered employees the option of a workplace pension and automatically enrol them into a scheme by October 2018. With implementation times estimated at 12 months, and fines for companies that fail to complete workplace pensions in time, we urge all employers to begin planning as a matter or urgency. Further details are available in our fact sheet, click the image below for details. We're delighted for our partner, J R Hopper & Co, with their recent Customer Relocation award from the Relocation Agent Network. At a prestigious award in London, some of the J R Hopper team were on hand to collect their award from TV's Stephen Mangan, of Green Wing fame and also Richard Tucker from Relocation Agent Network. The team were delighted to win the award, and they thoroughly deserve it for all their hard work during the year. The rules regarding the 55% Death Tax on inherited pension pots are changing. The Chancellor has announced that the current 55% death tax on inherited pension pots will be abolished. If a pension saver dies before the age of 75, then his or her pension can now be passed to a spouse or partner tax free. This even applies if the pension has been utilised. People with a joint life or guaranteed term annuity can pass this on tax free also. This change will come into effect in April 2015. If you own or manage a business, then you should already have heard about Auto Enrolment (AE) or workplace pensions. If you employ staff (even 1 person), then AE will affect you. By October 2018, it will be a legal requirement (punishable by a fine) for all* companies to automatically enrol their staff onto a pension scheme, and pay a 1% minimum contribution towards it. By October 2018, all companies that employ staff must comply with AE legislation. However, subject to the size of your business, you may need to comply earlier. 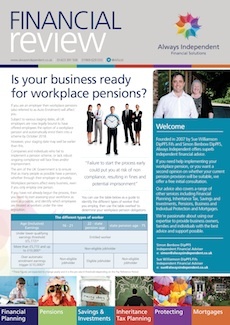 For more information about Auto Enrolment or workplace pensions contact us for further details. According to the Telegraph, those of us that make up Generation Y (currently aged 18-33) may not receive the same generous pensions as the rest of us who are at (or coming up to) retirement age. If you are planning to retire on a state pension, then you may want to review your financial plans and budgets. According to the money advice service, a basic state pension is currently £113.10 per week for a single person, or £226.50 for a couple provided that both have enough qualifying years. For some people, a basic state pension will not be enough for them to sustain their desired lifestyle upon retirement. Having an effective financial plan which will offset any budget shortfall is therefore important. 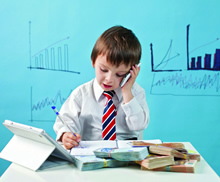 You may plan to utilise savings, downsize to release capital or have investment income which will offset any shortfall. In either event, these need to be part of your financial plan, based upon a clear understanding of your monthly expenditure. Someone saving £100 per month for 40 years (eg from 25 to 65) would put the same amount into their pension fund as someone starting 20 years later, who pays £200 per month. If you're unsure whether your financial plan or pension plans are right for you, or you need help creating them, Always Independent are here to help. We offer every client a free initial meeting to discuss their needs, and can provide independent expert advice.